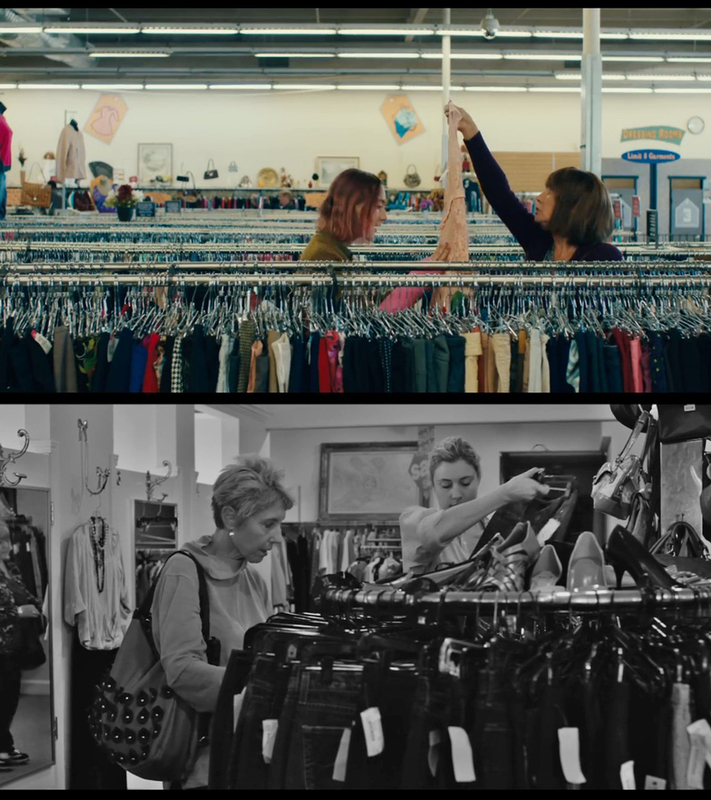 Starring two-time Oscar nominee Saoirse Ronan in the title role (although her real name in the film is Christine McPherson), Lady Bird is essentially a prequel to Gerwig's character arc in Frances Ha. The setting is once again Sacramento, the date is the early 2000s and Christine a.k.a. "Lady Bird" is embarking on an event-filled senior year of high school. 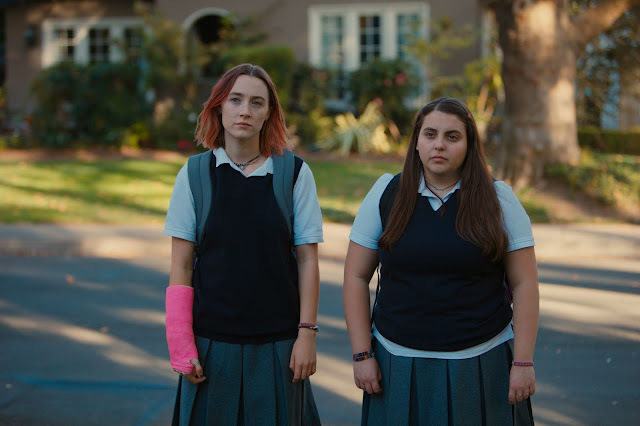 Lady Bird and her best friend Julie (the scene-stealing Beanie Feldstein) have their usual day-to-day highlights of brown bagged lunches and being each other's support system through the rigmarole (at least in their eyes) of what it means to survive the monotony of going to an all girls Catholic high school. Back home, Lady Bird's parents are going through their own challenges. Her mother Marion (an Oscar-worthy Laurie Metcalf) works the graveyard shift at a mental hospital and is constantly spinning plates of worry and responsibility, while Lady Bird's father Larry (Tracy Letts, also good) recently lost his job and is imploding in his own way. Their oldest son and his girlfriend also live in the house, which only adds to the domestic melting pot under the sunny California skies. If I have painted a film that sounds serious and daunting, then I apologize. The reality is that Gerwig has written and directed one of 2017's most enjoyable moviegoing experiences with Lady Bird. It's a small miracle of a film because it takes the tropes, soundtrack and offbeat humor we've seen in previous similar films (I'm looking at you Juno) but it actually adds real heartbreak and implicit revelations that are exquisitely captured. Miraculously, for all of its mildly dark and cynical humor this film is brimming with a lot of affection. You can feel Gerwig in each scene, going over the memory of her youth and then pressing into you a little too, for identifying with the chemistry of those moments. With Laurie Metcalf's performance we have one of the great movie moms in recent cinema history. She's cold, blunt and sometimes cruel. But she also hurts and wants what's best for her daughter. The relationship that her and Lady Bird share will resonate with anyone who's ever held resentment for their parent for (possibly) holding them back. It's an exceptional set of performances from both Metcalf and Ronan and I get the feeling the two of them will be walking the red carpet at the Oscars, along with Gerwig who definitely deserves a Best Director nomination here. And did I mention how funny this film is? I wouldn't dare spoil it for you but I will say that the high school football coach here scores the biggest laughs. In the end, Lady Bird hits you in the way the best movies do: leaving you hoping that the characters you've grown to love end up okay. I know I went home after my screening and queued up Frances Ha to have peace of mind.